I might add some more pics later, I still have a bunch to look through. I would like to add that I'm very thankful to everybody who chooses to work with me. They all always work for free. Without their generosity I simply wouldn't be able to do what I love doing. Super great weekend. I got so see "District 9" which I loved. Sunday, finally a new shoot. I've been itching to do another shoot. This one I was especially excited about because I got to work with new people. Several years back I asked my good friend Rosalinda to sit for one of my portraits. She however didn't feel comfortable doing a photo shoot at the time. I dropped the matter after that and was quite surprised and excited when she came around this year and asked me to do a shoot. I knew she would photograph well, she's beautiful and has such interesting features. Then I was also super happy to have my co-worker Lauren on board for make up. She's a professionally trained make up artist and I knew she could handle whatever I threw at her. I therefore went with something more dramatic then usual. Heavy make up and feathers (subtle) for eye lashes. As always I did the accessorizing (but I did brainstorm with Rosalinda and she had some great elements that we added). I found some awesome strung feathers at a craft store that we used as a top and cuffs. The shoot went well. Lauren nailed the make up and although Rosalinda had never modeled before she did an awesome job. That girl has stamina, this was my longest shoot ever. Only problem was I kind of messed up on some of the pics. I didn't notice there was a slight lens flair in some of the shots. Oh well, can't have everything. More 2009 goodness..... 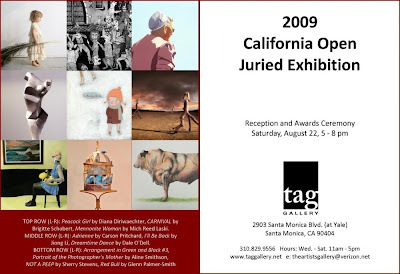 I got a piece into a group show at the TAG Gallery in Santa Monica, CA (first west coast show, yay). Check it out if you're in the area (end of August). Then The "Colors Of Life" group show is going to be on display at the Artspace in Richmond, VA in September. And in some more awesome news, one of the "Little Mermaid" images has won a place in the summer 2009 Women in Photography International competition (subject, children).